NICOLE RICHIE NEWS: Are you ready to get Styl'D ? Are you ready to get Styl'D ? Styl'D ~ The hottest programme for all fashionista's is set to hit our TV screens this weekend! The show follows the real lives (friendship, love, & career) of five junior assistants as they toil for three glamorous, high-end celebrity stylists. Styl'D is set to air on MTV this fall, this documentary series will follow the young junior assistants on the job - music videos, movies, red carpets, etc. It will also follow them in their off-hours as they find romance, plot against each other, and try to make it big in a difficult industry, all while living on a meager junior assistant salary -- and all while looking great. Nicole Richie will be featuring in the 5th episode of Styl'D so be sure to tune in! Meet the cast of Styl'D & see some sneak peek clips from the show over at the Styl'D website. Styl'D is highly anticipated and it is set to be a big hit this year! 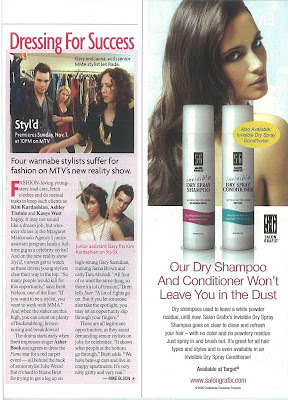 Star Magazine has done a feature about the show..
What happens when you mix A-list celebrities, high profile stylists, and eager junior stylists all vying for a coveted job with the Margaret Maldonado Agency? Find out This Sunday (November 1st) 10 PM ET/PT on MTV. Become a fan of Styl'D on Facebook to get involved and hear all the latest news about the show.